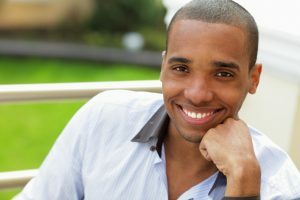 If the reason you don’t smile is because of cracks and chips on your teeth, porcelain veneers may be a viable solution. Made of strong, tooth-colored porcelain, veneers are thin shells that are custom-made to fit the size and shape of your teeth. Mission Viejo dentist Dr. Robert Milner uses porcelain veneers to create seamless smiles that are both natural-looking and resilient. Read on to learn whether porcelain veneers can transform your smile into a beautiful, healthy one. Porcelain veneers are typically placed over the course of two visits to our Mission Viejo office. Each stage is painless and typically requires only a local anesthetic to ensure that you are comfortable and relaxed through the entire process. During your first visit, Dr. Milner will remove a small amount of enamel from the surface of your teeth where the veneers will be placed. Next, he will make an impression of your teeth in order to create custom-made veneers that fit the size and shape of your teeth. Your veneers will be matched to the color of your teeth using a tooth shade guide. Dr. Milner will send the impression to the dental laboratory so your custom veneers can be made. Once your veneers are ready, you will return to our office for placement. Dr. Milner will remove the temporary veneers and place your new porcelains veneers. Before bonding the veneers to your teeth, the dentist will check your bite and make sure that the veneers look and feel right. Maintaining the durability and beauty of your porcelain veneers requires optimal oral hygiene. Brushing twice a day and flossing at least once a day is essential. Our dental team also recommends avoiding foods and beverages that can stain your veneers and natural teeth. Professional cleanings and checkups with our dental practice can keep your smile dazzling for years to come. Dr. Milner understands that even the smallest chip or crack is enough reason to hide your smile. With porcelain veneers, he helps patients achieve a more beautiful smile by concealing dental flaws. Porcelain veneers also protect your teeth from bacteria that can cause decay, ensuring your new smile is both beautiful and healthy. On average, porcelain veneers should last around 10-15 years if cared for correctly. To extend the life of your veneers it is important to practice good oral hygiene habits, avoid chewing on hard objects, address any issues you may have with teeth grinding, and use a mouth guard if playing contact sports. If for any reason your veneers experience damage, contact Dr. Milner right away and he will be happy to assist you. Porcelain veneers are composed of durable and natural looking materials that make them resistant to damage. However, similar to natural teeth, it is possible for them to crack so it is important to treat them with care. Can I Still Get Cavities If I have Veneers? While the material of the veneers does not decay, the existing teeth that the veneer is bonded to is still susceptible to cavities, so it is important to brush and floss every day, and visit your dentist for regular checkups. Will My Dental Insurance Cover Porcelain Veneers? Porcelain veneers are generally considered to be a cosmetic procedure so your insurance may not cover the costs. However, this can vary depending on the reason why you are getting veneers and your specific dental insurance plan. It is best to consult your insurance provider to see if they will pay for your veneers. If you would like to know whether porcelain veneers can address your dental needs, contact the dental practice of Dr. Milner. Please call 949-859-8899 today.